The major gold miners are still struggling fundamentally. Their production shrinkage is accelerating, pushing costs proportionally higher. That led to weaker sales and operating cash flows in Q4. And, accounting profits cratered into a dark abyss on enormous and suspicious impairment charges by big gold miners involved in mega-mergers. These poor results are retarding GDX’s upside potential. But smaller mid-tier gold miners with superior fundamentals are bucking this trend to enjoy big stock-price gains. They are able to grow production off way-smaller bases, boosting their earnings. The major gold miners are grinding higher in a solid upleg, fueling growing interest in this small contrarian sector. They've mostly finished reporting their fourth-quarter results, revealing how they are really faring fundamentally. Collectively, the world's biggest gold miners continue to face serious challenges, which often stem from declining production. That makes stock picking more important than ever for investment success. Four times a year, publicly-traded companies release treasure troves of valuable information in the form of quarterly reports. Required by the US Securities and Exchange Commission, these 10-Qs and 10-Ks contain the best fundamental data available to traders. They dispel all the sentiment distortions inevitably surrounding prevailing stock price levels, revealing corporations' underlying hard fundamental realities. While 10-Qs with filing deadlines of 40 days after quarter ends are required for normal quarters, 10-K annual reports are instead mandated after quarters ending fiscal years. Most gold miners logically run their accounting on calendar years, so they issue 10-Ks after Q4s. Since these annual reports are larger and must be audited by independent CPAs, their filing deadlines are extended to 60 days after quarter ends. The definitive list of major gold mining stocks to analyze comes from the world's most popular gold stock investment vehicle, the GDX VanEck Vectors Gold Miners ETF (GDX). Launched way back in May 2006, it has an insurmountable first-mover lead. GDX's net assets running $10.6b this week were a staggering 47.1x larger than the next-biggest 1x-long major gold miners ETF! GDX is effectively this sector's blue-chip index. It currently includes 45 component stocks, which are weighted in proportion to their market capitalizations. This list is dominated by the world's largest gold miners, and their collective importance to this industry cannot be overstated. Every quarter, I dive into the latest operating and financial results from GDX's top 34 companies. That's simply an arbitrary number that fits neatly into the tables below, but a commanding sample. As of this week, these elite gold miners accounted for fully 94.1% of GDX's total weighting. Last quarter, they combined to mine 300.8 metric tons of gold. That was 35.2% of the aggregate world total in Q4'18, according to the World Gold Council, which publishes comprehensive global gold supply and demand data quarterly. So, for anyone deploying capital in gold or its miners' stocks, watching GDX miners is imperative. The largest primary gold miners dominating GDX's ranks are scattered around the world. 21 of the top 34 mainly trade in US stock markets, 6 in Australia, 5 in Canada, and 1 each in China and the United Kingdom. GDX's geopolitical diversity is good for investors but makes it more difficult to analyze and compare the biggest gold miners' results. Financial reporting requirements really vary from country to country. In Australia, South Africa, and the UK, companies report in half-year increments instead of quarterly. The big gold miners often publish quarterly updates, but their data is limited. In cases where half-year data is all that is made available, I split it in half for a Q4 approximation. While Canada has quarterly reporting, the deadlines are looser than in the States. Some Canadian gold miners drag their feet in getting results out. While it is challenging bringing all the quarterly data together for the diverse GDX top 34 gold miners, analyzing it in the aggregate to see how they are doing is essential. So, each quarter, I wade through all available operational and financial reports and dump the data into a big spreadsheet for analysis. The highlights make it into these tables. Blank fields mean a company hadn't reported that data as of this Wednesday. The first couple columns of these tables show each GDX component's symbol and weighting within this ETF as of this week. While most of these stocks trade on US exchanges, some symbols are listings from companies' primary foreign stock exchanges. That's followed by each gold miner's Q4'18 production in ounces, which is mostly in pure gold terms. That excludes byproduct metals often present in gold ore.
Those are usually silver and base metals like copper, which are valuable. They are sold to offset some of the considerable expenses of gold mining, lowering per-ounce costs and thus raising overall profitability. In cases where companies didn't separate out gold and lumped all production into gold equivalent ounces, those GEOs are included instead. Then production's absolute year-over-year change from Q4'17 is shown. Next comes gold miners' most important fundamental data for investors, cash costs and all-in sustaining costs per ounce mined. The latter directly drives profitability which ultimately determines stock prices. These key costs are also followed by YoY changes. Last but not least, the annual changes are shown in operating cash flows generated, hard GAAP earnings, revenues, and cash on hand with a couple exceptions. Percentage changes aren't relevant or meaningful if data shifted from positive to negative or vice versa, or if derived from two negative numbers. So, in those cases, I included raw underlying data rather than weird or misleading percentage changes. Companies with symbols highlighted in light blue have newly climbed into the elite ranks of GDX's top 34 over this past year. This entire dataset together is quite valuable. It offers a fantastic high-level read on how the major gold miners are faring fundamentally as an industry. Unfortunately, they were generally struggling on multiple fronts in Q4'18. The more quarterly reports I read and data I gathered, the more apparent it became that many, if not most, of the world's biggest gold miners continue to face serious challenges. That makes GDX itself way less attractive to gold stock investors. GDX's holdings grew much more concentrated over this past year, with the top 34's total weighting rising from 90.5% in Q4'17 to 94.1% in Q4'18. That is partially due to increased merger and acquisition activity driven by big gold miners trying to replace depleting production. For years, many have proven unable to replenish mined gold organically, leaving buying other companies the only option to maintain mining tempos. Production has always been the lifeblood of the gold mining industry. Gold miners have no control over prevailing gold prices. Their product sells for whatever the markets offer. Thus, growing production is the only manageable way to boost revenues, leading to amplified gains in operating cash flows and profits. Higher production generates more capital to invest in expanding existing mines and building or buying new ones. Gold stock investors have long prized production growth above everything else, as it is inexorably linked to company growth and thus stock price appreciation potential. But, for some years now, the major gold miners have been struggling to grow production. Large, economically-viable gold deposits are getting increasingly harder to find and more expensive to exploit, with the low hanging fruit long since picked. More and more gold industry experts believe peak gold is nearing, after which global mine production will start declining. For many years now, new deposit discoveries and mine builds have failed to keep pace with depletion at existing mines. So, production growth is slowing. According to the World Gold Council's latest fundamental data, global mine production only edged 0.8% higher in 2018 compared to 5.3% in 2013! GDX's major gold miners are the biggest in the world, with access to many billions of dollars of capital to expand their operations. Yet even with those vast resources by his sector's standards, the top 34 have still failed to grow their production. In Q4'18, they collectively produced 9.7m ounces of gold, plunging a colossal 7.5% YoY from Q4'17's 10.5m! That is shockingly bad and the root of the major gold miners' problems. Total world gold production per the WGC merely slipped 0.9% YoY last quarter. Incidentally, that was just the second YoY quarterly decline in the past 32 quarters, adding more fuel to peak gold theories. Across all of them, growth averaged 2.5% YoY. Seeing the top 34 GDX gold miners' production plunge at 8.3x the world rate in Q4'18 is very concerning. Many major gold miners are stagnating, retarding GDX's potential. Just over half of GDX's top 34 gold miners, fully 18 of them, suffered average production declines of 8.9% YoY! The worst in terms of impact came from GDX's largest component Barrick Gold (GOLD). GOLD's gold mined fell 5.8% YoY in Q4'18, representing 1/10th of the total drop among the GDX top 34. Barrick is so desperate to buy production to offset its serious depletion that it recently purchased major gold miner Randgold. That deal completed on January 1st, 2019, so GOLD's Q4'18 results don't yet reflect it. Randgold mined 374.6k ounces last quarter, which was actually up an impressive 9.9% YoY. That helps explain some of the big production drop among the GDX top 34. Randgold's production was included in the GDX top 34 in Q4'17, but of course, its stock no longer exists this week when I downloaded GDX's current component list. Adding Randgold's Q4'18 production in cuts the GDX top 34's production decline to 3.9% YoY. Going the other way and instead removing it from Q4'17's total leaves the top 34's mined gold down 4.4% YoY. But that's still much worse than that overall 0.9% YoY decline in global gold mine production last quarter. As I explained in depth in a mid-February essay, gold stock mega-mergers won't solve this depletion problem. Before Q4'18, Randgold suffered 4 quarters in a row of falling production, averaging declines of 7.4% YoY. Barrick's quarterly production has fallen for 6 quarters in a row, averaging hefty 13.4% YoY drops! Merging depleting major gold miners together doesn't magically boost their collective production. It just masks production declines for a single year, the first 4 quarters comparing post-merger results with pre-merger ones. Once those great cross-merger YoY comparisons pass, the relentless depletion in both companies' gold mines will quickly become apparent again. The larger any gold miner, the harder it is to grow and even just maintain production levels. Because exploration budgets largely collapsed since 2013 when gold plunged and crushed gold stocks, the global pipeline of bigger economic gold deposits to mine has mostly dried up. GDX's top-two components have always been Barrick Gold and Newmont Gold (NEM). This week, together, they accounted for 19.5% of its total weighting and a whopping 28.0% of the top 34's total Q4'18 gold mined! Had Barrick's and Randgold's merger been consummated in Q4, GOLD's production would've soared over 1.8m ounces. Newmont didn't want Barrick to surpass it, so in January, it announced it was buying Goldcorp (NYSE:GG). GG produced 630k ounces of gold in Q4, which will be added onto Newmont's production going forward once this deal is done. Had Newmont and Goldcorp been together in Q4'18, this gold mining behemoth would've produced nearly 2.1m ounces! Those levels are staggering and will really increase these two mega-miners' dominance over this sector and GDX. These mergers' pro forma impact on GDX is massive. Using Q4's numbers, Newmont and Barrick would've accounted for a colossal 38.8% of the GDX top 34's entire gold mined, including Randgold. Their collective weighting in this leading gold stock ETF would shoot over a quarter. So, the overall GDX future performance will be more dominated by Newmont and Barrick than ever before. If they can't grow production from such stratospheric levels, they'll retard GDX's upside. With gold deposits increasingly harder to discover, and taking even longer to get permitted and brought into production at ever-higher costs, the biggest gold miners are going to find it impossible to even maintain their outputs. Any production growth is going to come from smaller gold miners, and their stocks will soar to reflect it. Unfortunately, the impact on GDX will be muted, since its weightings are tyrannized by the giants. Kirkland Lake Gold (KL) has been one of the best-performing gold stocks over this past year. In 2018, its stock rocketed 69.9% higher as GDX fell 9.3%! The reason investors flocked to KL is it has rapidly grown its gold output, which soared 38.8% YoY in Q4'18. That greatly boosted its sales, operating cash flows, and profits. More gold produced spreads out the big fixed costs of mining across more ounces, amplifying earnings. No matter how awesome KL's management has proved, such production growth was only possible from a relatively low base. KL produced 167k ounces of gold in Q4'17, compared with around 8x that from each Newmont and Barrick. The biggest gains in gold stock prices won't come from super-major-dominated GDX, but from smaller mid-tier gold miners. Investors will continue to prize and richly reward production growth. Peak gold is likely bearish for the largest gold miners that drive GDX. Capital inflows from investors will wane along with their shrinking production. But lower gold mined supply on balance going forward is wildly bullish for the mid-tier and junior gold miners growing their production! The resulting higher gold prices will catapult their profits and thus stock prices far higher, attracting investors fleeing the struggling majors. The only way to reap these massive gains is directly investing in the best individual gold miners. Their fundamentals are far superior to their sector's as a whole. While buying GDX is easy, the lion's share of that capital is funneled into the major gold miners with slowing production. Their underperformance will dilute away any outperformance among mid-tier miners in this ETF, leading to way inferior overall gains. Given the sharply-lower gold production by the GDX top 34 in Q4'18, per-ounce mining costs should've risen proportionally. Gold-mining costs are largely fixed quarter after quarter, with actual mining requiring the same levels of infrastructure, equipment, and employees. So, the lower the production, the fewer ounces to spread mining's big fixed costs across. These elite gold miners indeed reported higher costs last quarter. There are two major ways to measure gold-mining costs, classic cash costs per ounce and the superior all-in sustaining costs per ounce. Both are useful metrics. Cash costs are the acid test of gold-miner survivability in lower gold price environments, revealing the worst-case gold levels necessary to keep the mines running. All-in sustaining costs show where gold needs to trade to maintain current mining tempos indefinitely. Cash costs naturally encompass all cash expenses necessary to produce each ounce of gold, including all direct production costs, mine-level administration, smelting, refining, transport, regulatory, royalty, and tax expenses. 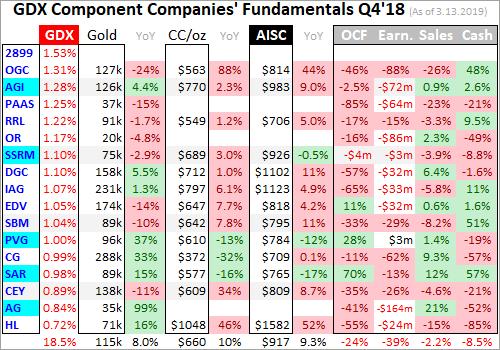 In Q4'18, these top 34 GDX component gold miners that reported cash costs averaged $655 per ounce. That was up a sharp 9.1% YoY, among the highest quarterly cash costs seen in years. That still shows the major gold miners face no existential threat as long as gold stays over $650, which is about half current levels. And Q4's cash costs are artificially high due to two anomalies. Buenaventura (BVN) and Hecla (HL) both reported cash costs rocketing to extremes of $1,627 and $1,048! Excluding these outliers, the rest of the GDX top 34 averaged cash costs of $598, which was right in line with Q4'17's overall $600 read. Way more important than cash costs are the far superior all-in sustaining costs. They were introduced by the World Gold Council in June 2013 to give investors a much better understanding of what it really costs to maintain gold mines as ongoing concerns. AISCs include all direct cash costs, but then add on everything else that is necessary to maintain and replenish operations at current gold production levels. These additional expenses include exploration for new gold to mine to replace depleting deposits, mine development and construction expenses, remediation, and mine reclamation. They also include the corporate-level administration expenses necessary to oversee gold mines. All-in sustaining costs are the most important gold mining cost metric by far for investors, revealing gold miners' true operating profitability. The GDX top 34 gold miners reported average AISCs of $889 in Q4'18, up 3.6% YoY. That is inversely proportional to the 4%ish YoY drop in their gold production when Randgold is accounted for. While $889 is the highest seen since at least Q2'16 when I started doing this quarterly research, it is still roughly in line with the past four quarters' averages of $858, $884, $856, and $877. And like cash costs, this is skewed high. Buenaventura and Hecla also reported anomalous super-high AISCs of $1,485 and $1,582. Excluding them, the rest of the GDX top 34 averaged much-lower all-in sustaining costs of $837 per ounce in Q4'18. So much to their credit, the major gold miners are ruthlessly managing their costs as their production slumps. That's bullish for their coming earnings growth as gold continues grinding higher in this bull market. Gold mining profits really leverage higher gold prices, and big earnings growth attracts in investors to bid up stock prices. In Q4'18, gold averaged about $1,228 per ounce. At the GDX, top 34's average AISC is $889, which implies the major gold miners as an industry were earning profits of $339 per ounce. Those are going to grow considerably this quarter. The almost-over Q1'19 has seen average gold prices near $1,303. AISCs are likely to decline from Q4's high levels in this current Q1, but let's assume they remain stable at $889. That implies the major gold miners are earning about $414 per ounce this quarter. In other words, a mere 6.1% quarter-on-quarter rally in average gold prices could drive a major 22.1% QoQ jump in the major gold miners' profits! That's why major gold stocks tend to amplify gold uplegs by 2x to 3x or so. It is encouraging the gold miners' costs remain well-positioned to fuel big profits growth in a higher gold price environment despite their intractable production slumps. Investors love chasing earnings growth, which is looking to be scarce in the general stock markets this year. The good gold miners' stocks are likely to see big capital inflows as gold continues climbing, driving them and, to a lesser extent, GDX higher. Unfortunately, the hard accounting results in Q4'18 were far worse than AISCs. 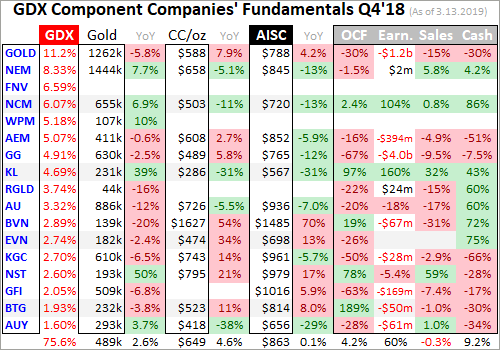 Q4'18's average gold price was 3.8% lower year over year, which combined with the 4%ish lower gold production, including Randgold among the GDX top 34, to really weaken financial performance. Overall quarterly revenues among these elite major gold miners fell 10.3% YoY to $12.8b. Operating cash flows amplified that drop. Total OCFs among these GDX stocks collapsed 30.4% YoY to $3.7b in Q4'18. That means less capital available to finance mine expansions and new mine builds, exacerbating the production struggles. Yet overall corporate treasuries fared relatively better with a 14.6% YoY decline to total cash balances near $12.1b for all these miners. All this was understandable, but hard GAAP accounting profits were a total disaster. Warren Buffett once famously joked about airline stocks, saying he would've done investors a huge favor if he could've shot down the Wright brothers' maiden flight in 1903 killing that whole industry before it was born. His point was the airlines never earned profits over the long term, so they weren't worth investors' time. The major gold stocks' Q4 losses made it look like they could never earn any money either, terrible. Last quarter, the top 34 GDX gold miners, the biggest and supposedly best in the world, lost a staggering $6.0b collectively! That compared to relatively-minor total losses under $0.1b in Q4'17. At $1,228, gold the major gold miners should've been earning solid profits. Yet, they were hemorrhaging money in an accounting sense fast enough to make drunken sailors blush. So, what the heck happened in this sector? The problem was colossal non-cash impairment charges, gold miners writing down the value of mines on their books for a variety of reasons. These were mainly lower forecast gold prices, reducing the economic reserves at those mines. While an accounting fiction, these perceived losses must still be flushed through income statements when they are believed to happen. The list of impairments disclosed in quarterlies was long. GOLD reported about $1.1b in impairment charges in Q4'18, AEM $390m, AUY $151m, AG $168m, and the list goes on. But the writeoff king last quarter was Goldcorp, reporting an inconceivable $4.7b in impairment charges across multiple mines! Newmont's offer for Goldcorp valued its mines much lower than their carried book value, forcing GG to write off the enormous differences in what may be its last solo quarter. Together, Barrick and Goldcorp wrote off $5.8b in assets in Q4'18, 97% of the GDX top 34's total GAAP losses last quarter! This is yet another reason gold stock mega-mergers are bad news for this entire sector. They give the managements of these giant gold miners cover for flushing away what were likely poor past decisions in allocating capital. Smaller miners focused on fewer mines seem to suffer fewer impairments. I've extensively studied and actively traded gold mining stocks for decades now, and these latest writeoffs seem really fishy. Major impairments are understandable in years gold plunges sharply, like 2013, when it plummeted 27.9%. That really changes the economic assumptions underlying the value of gold mines on balance sheets. But 2018 saw nothing like that, with gold slumping a trivial 1.6%. Big impairments made no sense. While the average gold price slumped 3.8% YoY in Q4'18, that isn't even material. And in full-year terms, 2018's average gold price was actually 0.8% higher YoY. Huge writedowns on a flat gold year don't look righteous at all. Gold mining company managements have a serious credibility problem with gold stock investors, and pulling stunts like this worsens it. These guys need to start managing for their shareholders. The major gold miners' Q4'18 results were disappointing overall. Huge sky-is-falling impairments, along with sharply-lower production driving much-weaker sales and operating cash flow generation, sure made GDX look like an iffy investment at best. Offsetting that negativity somewhat was good control over their all-in sustaining costs, which only moved modestly higher and would've fallen without a couple anomalous reads. The key takeaway here is avoid GDX. The world's leading gold stock ETF is increasingly burdened with giant gold miners struggling too much fundamentally. Their high weightings within this ETF are certain to retard its future performance. It's far better to deploy capital in great smaller individual gold miners with superior fundamentals. Plenty of these companies are included in GDX, but have relatively-low weightings. GDX's little brother ETF GDXJ is another option. While advertised as a "Junior Gold Miners ETF" (GDXJ), it is really a mid-tier gold miners ETF. It includes most of the better GDX components, with higher weightings since the largest gold miners are excluded. I wrote an entire essay in mid-January explaining why GDXJ is superior to GDX, and my next essay a week from now will delve into the GDXJ gold miners' Q4'18 results. Back in essentially the first half of 2016, GDXJ rocketed 202.5% higher on a 29.9% gold upleg in roughly the same span! While GDX somewhat kept pace then at +151.2%, it is lagging GDXJ more and more as its weightings are more concentrated in stagnant gold mega-miners. The recent big mergers are going to worsen that investor hostile trend. Investors should buy better individual gold stocks, or GDXJ, instead of GDX. The bottom line is the major gold miners are still struggling fundamentally. Their production shrinkage is accelerating, pushing costs proportionally higher. That led to weaker sales and operating cash flows in Q4. And, accounting profits cratered into a dark abyss on enormous and suspicious impairment charges by big gold miners involved in mega-mergers. These poor results are retarding GDX's upside potential. But smaller mid-tier and junior gold miners with superior fundamentals are bucking this trend to enjoy big stock price gains. They are still able to grow production off way smaller bases, boosting their earnings and attracting investment capital. They will continue amplifying gold's uplegs, multiplying wealth for their contrarian investors. Gold stock upside potential remains huge outside of the increasingly-problematic majors. Additional disclosure: I own extensive long positions in gold stocks and silver stocks which have been recommended to our newsletter subscribers.